Marketing with excellence will help your ministry grow (though that’s not a guarantee—your ministry’s growth is really just up to God). Growth from ministry marketing covers an entire range of topics—from having a solid website to promoting your ministry via content marketing and paid digital ads. Here is a summary of some of our top posts from the last year covering some of those topics. But one of the best ways to grow your ministry comes from the lessons Google Analytics teaches us about our own websites. Digging into the analytics for our clients’ sites, it is quickly apparent which of their digital communications efforts work well and which don’t—and why. I’ll show you how you can apply these lessons to your own site. 1. Know what’s important to measure. otherwise, you’ll just look at surface-level metrics (pageviews, bounce rates for example) that don’t really tell you anything in and of themselves. For example, say your ministry’s organizational goal is to increase awareness. One of the best ways to do that is by running a Facebook ad that drives traffic back to your website (preferably, to a specific event page, not just your home page). In this instance, the amount of web traffic to your website from that ad will be your point of measurement. Or maybe another goal is to increase donations to your ministry nonprofit. You’ll probably want to do some creative storytelling videos on Facebook and on your website that inspire people to action. On your website, pageviews, video plays, time on page and ultimately, number of conversions, will be important metrics (you’ll also want to know: did people get to these videos on your website from Facebook?). Bottomline: Know what you’re measuring and why that is important, or you’ll end up measuring stuff that really doesn’t matter. 2. Organic search traffic doesn’t necessarily mean you’re doing well at SEO. In your Google Analytics account, under the “Reporting” tab, go to “Acquisition” -> “Channels” and then look under the Default Channel Group. You’ll most likely see “Organic Search” as one of the top marketing channels (if not the top channel) that drives the most traffic to your website. Although that’s good (it shows that people already know about your ministry), it maybe isn’t great (you may not be reaching people who don’t yet know about you). If you have a Google Search Console account (you most definitely should -> learn more about Google Search Console here), you can click on “Search Analytics” in your account to uncover the search terms people use to find your ministry. If you see lots of variations of your ministry name, then you know people already know about your ministry, and they’re trying to find your website. Alternatively, if you see instances of the keyword phrases that you use on your website to inform people about what your ministry does (i.e. Christian humanitarian relief in Iraq, Brandenton Florida Christian church, etc), then your search engine optimization efforts may be working. 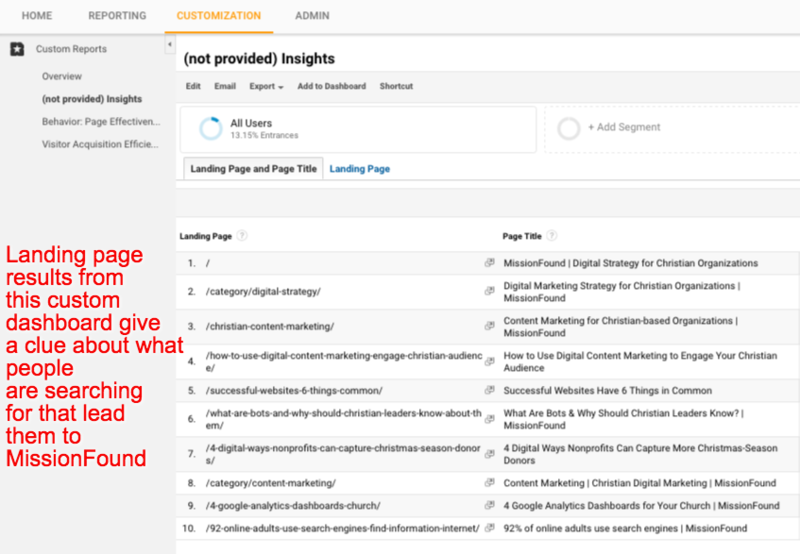 Hint: To gain deeper insights about the search phrases people use to find your Christian ministry, enable the SEO Insights for Google (not provided) custom dashboard in Google Analytics. Although it won’t show you specific phrases people use to find your site, you can gain insight around what people are searching for based on your landing pages people hit after doing a Google search. Bottomline: Use this data to optimize your website and content marketing for the intent of people searching online: what people are really trying to find when they search. 3. More people are viewing your site on mobile. The number of people viewing websites on mobile devices is growing steadily. Statistics are clear about this, but we’ve seen it on client websites too. If your organization is a church, you can bet that mobile traffic increases each Sunday. Google is clear about the importance of mobile-friendly (really, mobile-first) websites. Sooner than you think, Google may start penalizing sites that aren’t. Bottomline: Make sure your website works superbly on mobile. You can do a quick mobile-friendly test for your website here. 4. People want to know what you stand for. Increasingly, we’re seeing website visitors go right from the home page to “About Us” pages that go into detail about what the ministry stands for. People want to know: What does your ministry stand for? What is your message? What will I gain by attending your services or getting involved? Think about it like this: Your website is probably the second place people go, only after they find out about you by doing an online search, or coming across you on Facebook or hearing about you from a friend. What happens when people can’t find these important pages? They might go to other pages on your website—like events or news or how to get connected. But first-time web visitors typically just want to know: Who are you and what are you about? They don’t necessarily want to commit to your organization just yet. If they can’t find the right information and instead they’re met with a call to action like: “Donate!”, they are more likely to bounce away from your site. Bottomline: Your website should serve to give people the right information at the right time they’re searching for it. 5. Site search reveals the content people expect to find on your site. If you have site search enabled in Google Analytics, you can determine what search terms people use to find information on your site—and also how many pages people viewed after getting results for that search term. Although site search isn’t an important measurement, it does reveal what people want to learn more about from your website. And you can use this data to optimize key pages. Ask visitors to take an important action on top-searched pages that would then help your ministry meet more organizational goals or move people toward deeper engagement with your ministry. 6. You should care about conversion rates on your website. Sometimes, digital conversion rates can lead to life conversions. What I mean is, one of the best ways to know if your digital marketing efforts are impactful is to look at whether or not people “convert,” or take an action on your site. Examples would be to register for an event or sign up for a blog or buy a product if your ministry sells products. The point is that the more engaged someone is with your digital channels, sometimes, they more likely they are to engage with your ministry in person too. We can’t measure what people do in person. But we can measure what they do online. Let’s look at which online marketing channels are more impactful for driving online conversions—for this example, registrations. To measure conversions, though, you first need to make sure you set goals in Google Analytics. Once your goals are set up and Google Analytics has had sufficient time to collect data, you can go to your “Reporting” tab, then “Acquisition” and “Channels” to determine which marketing channels are most effective in achieving those goals. In this example, you can see that both referral traffic—other websites linking back to this site—and direct traffic—people who go directly to the URL—are the most effective in achieving conversions. Bottomline: Set up goals that matter in Google Analytics—those that indicate true engagement with your website—so you can measure which of your online marketing efforts lead to true online engagement. The point is real life engagement and conversion. 7. Your calls to action can improve. People first go to your website to understand more about your ministry. Once they do that, some of them may come back and watch sermons or read blog posts. Some of those people may come back again and sign up for an event. It’s important to know this and set your calls to action accordingly. Too many calls to action on one page causes confusion and people lose interest. When people first hit your website, they want to learn about your ministry. When people come back to your website, they are usually ready for more engagement—say, to sign up for your blog or newsletter. When they come back again, they might be ready to attend a service or register for an event. Bottomline: Give people appropriate calls to action on appropriate pages. Don’t overwhelm them and give all your calls to action on the home page. They’ll be confused and will just leave. 8. Site performance can make or (literally) break your website. If your website or web pages take more than 3 seconds to load, you risk losing visitors. You can know more about your website’s performance by going to the “Reporting” tab and then “Behavior” -> “Site Speed”. 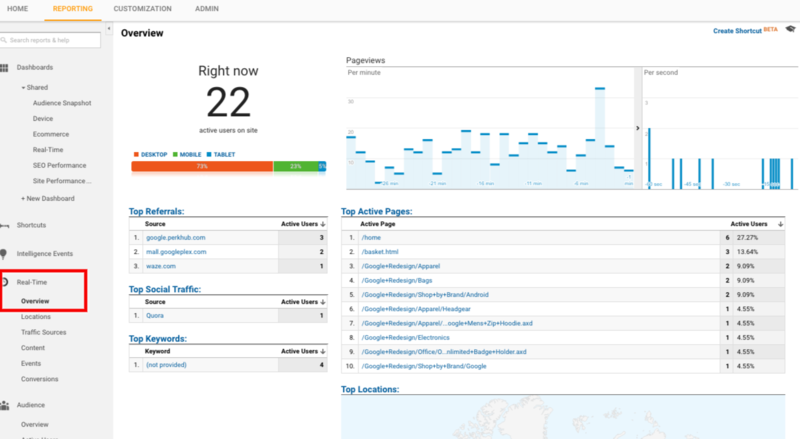 Or, add the Site Performance custom dashboard to your Google Analytics account. Google Search Console also will give some information about your website’s performance. And you can test your site’s performance here. 9. If you live stream on your site, your visitors may not be watching the entire stream. Go to the “Reporting” tab and then “Real Time” -> Overview. The biggest insights will be an understanding for how long viewers stay on the livestream. In many cases, viewers don’t watch the entire stream. If most leave, say, right after worship and don’t stay for the sermon, that’s important information to know. Why is that the case? What can your ministry do to change that and encourage livestream viewers to watch the entire thing? It’s also helpful to learn from this report what type of device your viewers use to view the livestream and where most of them are located. Hint: Google Analytics counts a website visitor’s session automatically as being 30 minutes. After 30 minutes with no activity from the visitor, the session times out. If a visitor is watching a one-hour-long livestream, Google Analytics would time out after the first 30 minutes. 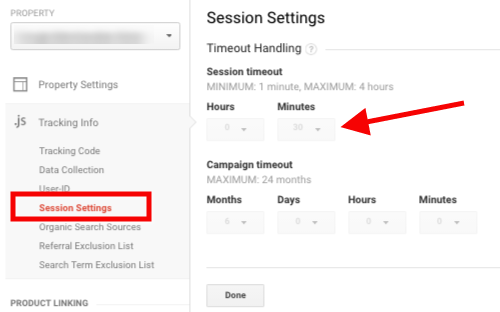 If a visitors takes an action on your website after the first 30 minutes, Google Analytics counts that as a second session. We recommend adjusting your session settings if you livestream on your website. Bottomline: Real-time web traffic can reveal much about the effectiveness of your livestream. 10. New visitors mean your “awareness” content marketing efforts are working. Returning visitors mean your “consideration” content marketing efforts are working. People first go to your website to learn more about you. At this stage in their cognitive process, they are aware of you and interested in learning more. The first time they go to your website, they are called “New Visitors” in Google Analytics. As an example, if your ministry is local, it’s beneficial to understand if people coming to your ministry’s website are also local and whether or not they are a first-time visitor to your site or they are returning to it. In this way, you can understand which type of content you’re creating is most effective for which visitor type. Thus, you gain an understanding for the type of content and calls to action most likely to influence their engagement in person. Doing this for specific landing pages on your website is even more effective. If reaching new people in your city or nearby cities is important to your ministry’s organizational goals, then you need to understand the effectiveness of key pages on your website for doing this. You might be surprised where people come from. They may come from many miles away, nowhere near your city. If that’s the case, then consider placing Facebook ads that reach people within, say, 25 miles of your ministry, and point them to specific key landing pages. Bottomline: New visitors to your site show that outreach or content marketing efforts are working. Returning visitors means content marketing is working to further engage people. If you want your ministry website to grow, it’s important to dig deeper, beyond surface-level metrics to understand what is happening on your ministry website and why. Knowing this can help you optimize your marketing efforts that work and stop wasting time and money on the ones that don’t. If you are involved in digital communications, content, media, marketing or analytics for your Christian-based nonprofit, ministry or business, MissionFound is for you. We have one mission: to excel at digital. Get our bi-monthly email and never miss a post.